Dairy does do a body good! Dairy foods are an excellent source of several essential nutrients (including calcium, magnesium, phosphorus, potassium, protein and vitamin D) that work together to help protect bones. Just three servings every day of low-fat or fat-free cheese, milk or yogurt can help reduce the risk of osteoporosis later in life. Research has shown that when consumed as part of a healthy diet, dairy foods improve overall diet quality and may help to reduce the risk of osteoporosis. One way to improve and maintain healthy bones is to meet the daily requirements for calcium and vitamin D. Foods and drinks that are calcium-rich include milk and milk products. 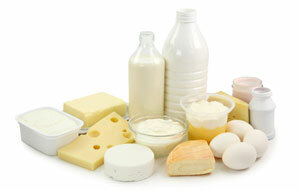 Research has also shown that three servings of cheese, milk or yogurt may help maintain a healthy weight. One study revealed that young, normal weight women who consumed at least three servings of dairy foods a day gained less body fat over 18 months than those who ate fewer than three servings a day. And recent investigations suggest that consuming dairy foods or dairy food nutrients such as calcium and vitamin D may protect against cardiovascular disease, particularly by their effect on risk factors, e.g., high blood cholesterol levels, hypertension, obesity.